I made these last year for the first time. I was asked to make a 2nd batch as my husband and son ate them so quickly! They have been requested again this year. This is the only recipe I will use for peanut butter eggs! Do you think I could sub coconut oil for the shortening? 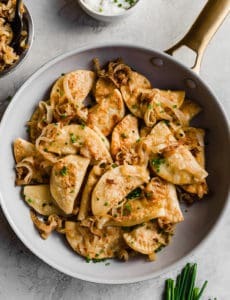 I have been looking for one of these recipes forever! Thank you so much! I am absolutely addicted to Reese’s peanut butter eggs! 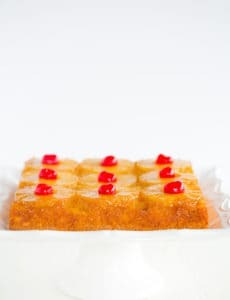 I’m attempting to make these for the second time, the first being a couple of years ago. They turned out pretty well then, but I can’t remember what I did right. I’ve followed the recipe to a tee (okay, with a 1/4 cup less powdered sugar as the mixture was sweet enough) but this time the eggs keep getting gooey while I’m trying to dip them, even after spending time in the fridge. I end up with way too much chocolate on them, which then flows off, solidifies and distorts the egg shape. I can’t dip them with a fork because I can’t even get them off the parchment without squishing them, and they bend while I’m lifting them out of the chocolate. I’ve put the rest of the bare peanut butter eggs in the freezer, but if this doesn’t work I’m going to turn the rest of the melted chocolate into Nutella, mush the naked eggs back together and add cream cheese for stability, and coat them with candy coating or something tempered – which is apparently what the other recipes out there use. Hi Terry, Using less powdered sugar sounds like the problem. Powdered sugar is used not just to sweeten, but to provide a stiff texture for the filling. If you cut back on it, they are likely way too soft. I thought the reduced sugar might be the problem; I just didn’t want to make them too sweet. I wonder if powdered milk would work as a substitute – ? Hi Terry, That might work! Let me know if you try it! Michelle– you are my mentor and I can’t wait to try yet another fabulous recipe as I do my Easter baking. I’m having an epiphany– go with me here– I plan to make a batch of these, alternately I’m thinking of substituting the Peanut Butter with Cookie Butter (my obsession at the moment) and substituting the chocolate with… wait for it… Nutella. Mind. Blown. What do you think??? And how much Nutella do you think I would need? Would I still use the Crisco? Hi Angela, I think cookie butter would certainly work, but I’m not sure about a Nutella coating. I don’t think it would actually set. Can I use 2 T butter instead of 2 T shortening? Hi Angela, Unfortunately this won’t work, but you could use coconut oil if you’d like. I just wanted to thank you for this great recipe! My 3-year old son has many allergies including all dairy, nuts and eggs. I was able to modify this recipe for him and they turned out great! For anyone with allergies, I substituted Wow Soy Nut Butter, Vegan Becel Margarine, and Enjoy Life Mini Chocolate Chips. It might be a few years still before my son is actually interested in eating them, but in the meantime I am able to enjoy an Easter treat knowing that it is safe for him if he does want to try it. Thank you again! I made these as a part of my son’s Easter basket. They turned out perfectly! Didn’t have any sprinkles around, so I drizzled a few of them with white chocolate. Can I use coconut oil instead of Crisco? I do not care for the taste it gives the chocolate. Hi Connie, You can, but be aware that it will impart a slight coconut flavor. I have never noticed any off taste from the Crisco, as it’s quite neutral. 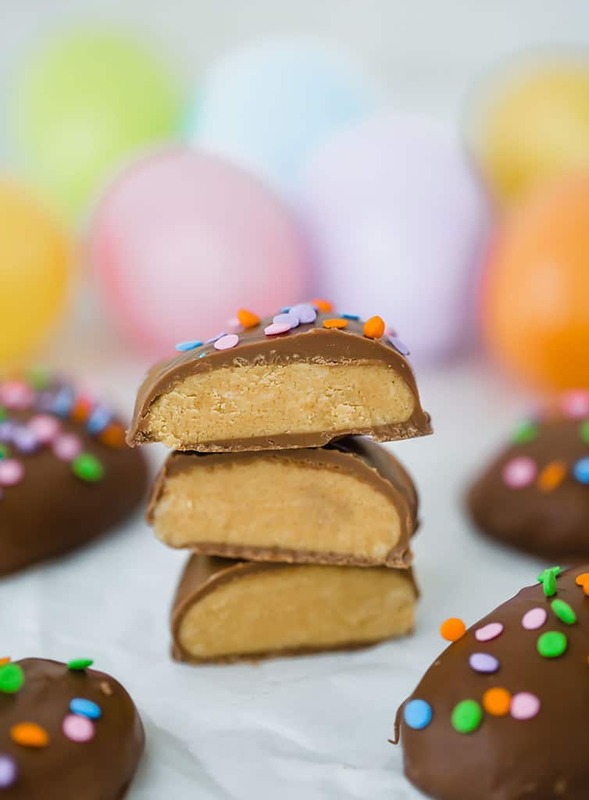 When making peanut butter balls (not this particular recipe, which I have not yet tried), I have trouble when it comes to dipping in the chocolate. The chocolate doesn’t stay smooth and melted and eventually becomes impossible to cover the peanut butter balls and I have to throw it out and start over. I thought the problem was the peanut butter melting into the chocolate, but I have tried freezing them before dipping and still have the problem. I even use melting chocolate (Wilton candy chocolate) and have tried both the double-boiler and the microwave. Any suggestions or ideas on what I’m doing wrong? Thanks, Michelle! Hi Tina, I really recommend using real chocolate and adding vegetable shortening (as indicated here). It’s the best results I’ve had. I keep a bowl over a double boiler as I dip so the chocolate stay warm and liquid. This is how I dip my peanut butter balls and always have success. We’ve made our own pb cups before as well, and there is no going back once you’ve done that. These are fun! I made these for my mom as an Easter gift (Reese’s Eggs are her favorite!) and she loved them. Thanks for the recipe! I made this last year, came out great! I just made them again and the pb filling is a little gritty- what did I do wrong? Did I cook the pb, sugar mixture too long or not long enough? Hi Melinda, It could have to do with not cooking it long enough. Hi Michelle, I made these last year and they were very good. However, I found them a little too sweet. 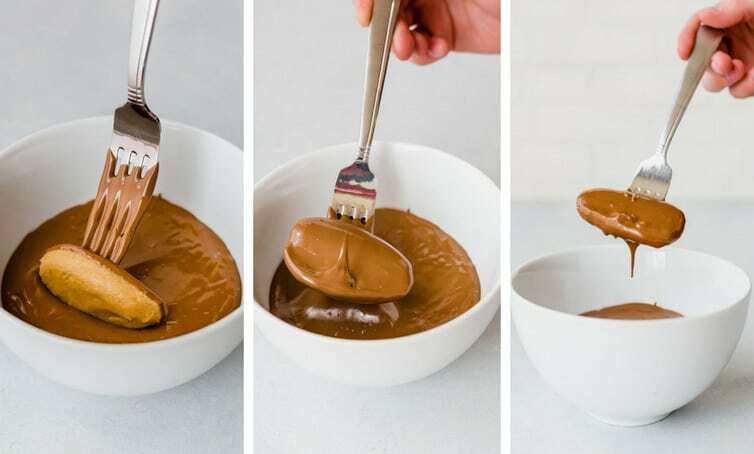 I found a similar recipe that didn’t have the brown sugar and instead added about a teaspoon of salt, which brought it closer in taste to a Reese’s peanut butter cup. Your pictures of these, however, are second to none! Hi Charlyn, Yes, you need those to achieve the right consistency (and flavor!). I plan to make these delicious-looking eggs today, but I didn’t see anywhere in anyone’s comments what the very cute decorations were that you used for the tops…. I made these last year and LOVED them! This year, I found out that my son is lactose intolerant, so I tried to modify the recipe to work around the food sensitivity. I was really nervous about changing the recipe, but they are wonderful! I used Smart Balance Light instead of butter, and melting chocolate that does not contain milk. I followed the directions exactly, and they turned out great! Thank you for such a wonderful recipe! Does the recipe need to be altered if i want to dip them in white chocolate? Nope, not at all! Enjoy! What do u do to get them not to stick to your hands when rolling? Hi Tonya, I didn’t really have an issue with them sticking too much to my hands. You could always coat your hands in a light dusting of powdered sugar. Do these have to be kept in the refrigerator?? Will they go bad? No, they don’t. Unless your kitchen is really warm or humid, in which case the chocolate could get soft and melty. I love “gritty” PB eggs! These are da bomb!! I added 1/2 tsp kosher salt, to make it less sweet, like a Reese cup. This recipe is a keeper! 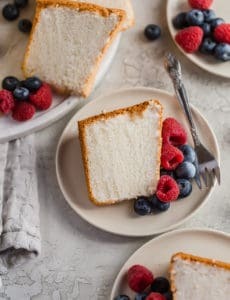 I’ve tried 4 recipes from this blog and so far they have all been hits! These were amazing. I almost wish I had made them smaller. They are so rich. I am just wondering what to do with all my leftover chocolate?? I am going to make these today!! 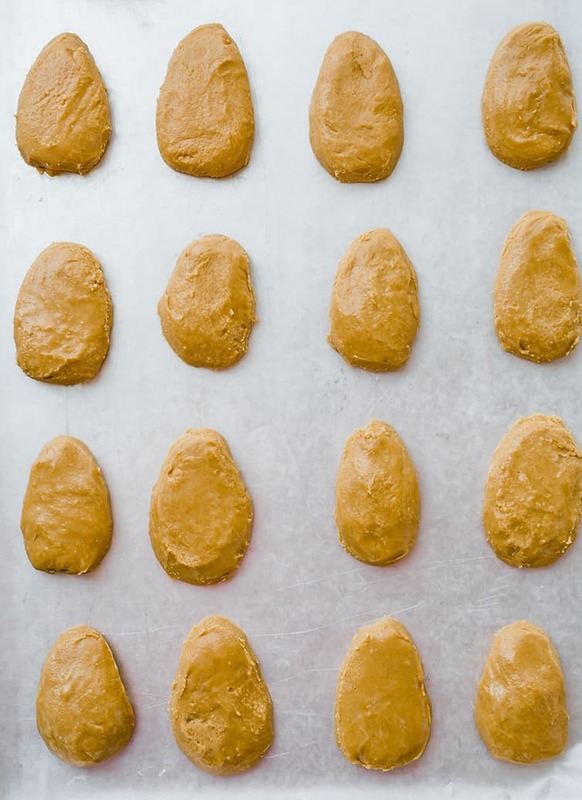 My son is allergic to peanuts so I can’t buy the actual Reese’s eggs but I am going to sub soy butter…it’s what we use for a pb replacement, I use it in anything that calls for pb. YUM!! Thanks for the recipe! Hi Sue, If they were cold from the fridge, they shouldn’t fall apart. If you notice they are too soft to dip, I would pop them in the freezer for 15 to 30 minutes before trying again. Also, did you use natural peanut butter? If so, that could cause them to stay soft. These were yummy and SO easy, though mine weren’t as pretty as yours. Also, I think I might not have cooked it long (or slowly) enough because the sugar stayed a little grainy. 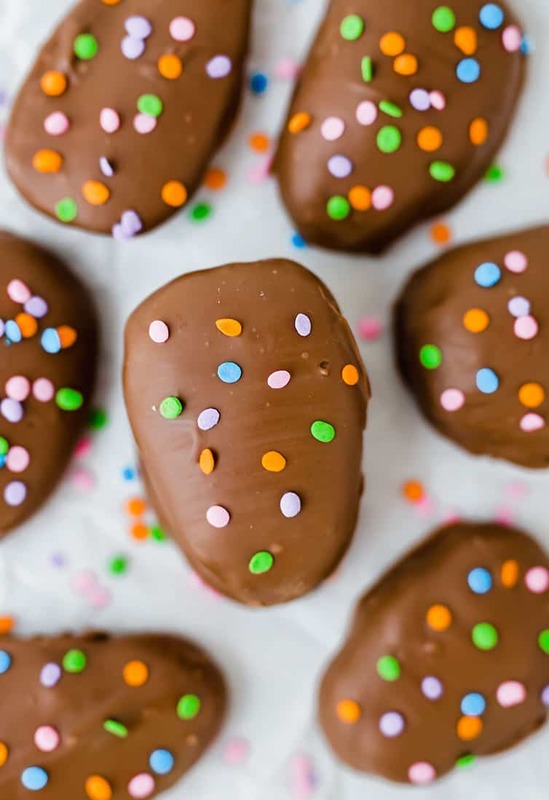 I made these eggs with dark chocolate instead of the milk chocolate and they were absolutely delicious! My husband was really wowed by them. Thanks for a great recipe! 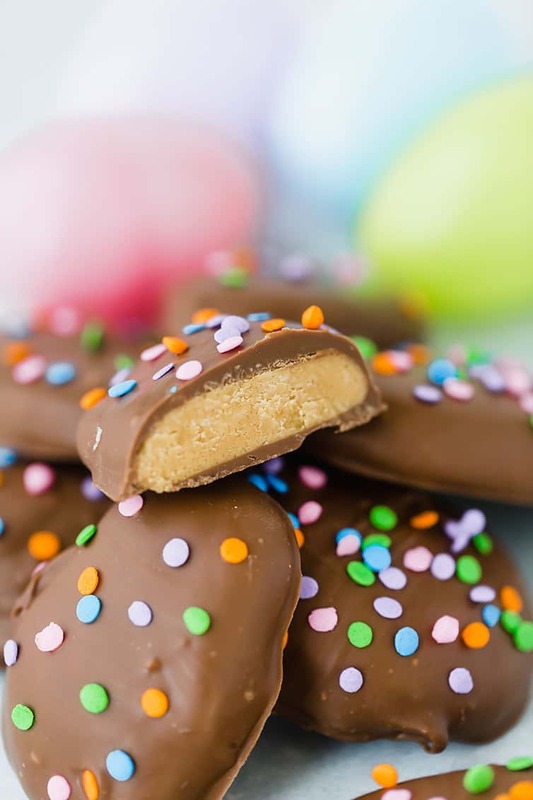 Okay, so I made these for Easter – I found out at the last minute I didn’t have milk chocolate, so I had to use semisweet. I would tell you how they turned out, but I didn’t even get one. They were gone by the time I got to the plate. I think that’s a pretty good indication that they were yummy. I made these to bring to my in-laws for Easter and they were a huge hit! I should have made 2 batches, because the adults were fighting the kids off of them. Everyone loved them. Another great one – thanks! !